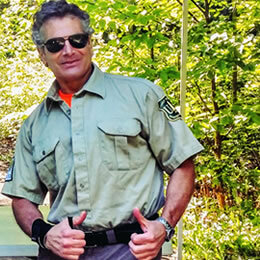 Howard as a USFS Trailhead Steward. Introduction: Howard grew up in RI, and has lived in Amesbury, Mass., for the last decade. Ever since he was a kid, he loved being outdoors, playing sports, sledding in the winter, and just staying fit. But, he didn’t start hiking until 2012, when he was 52. Before that, he was “gym rat,” natural bodybuilder, and triathlete. He rowed Crew in college, and was a 3 sport athlete in High School. Needless to say, Howard was fit enough to handle the rigors of hiking, but he had a lot to learn but has gained a lot of experience in the last four-plus years. Howard has been in sales for over 30 years, so we know that he can provide a very special, fun, upbeat, and positive experience, to whoever he guides or works with. Howard had no idea, that walking thru the woods and climbing to the tops of mountains would change his life, but it did. Résumé: Since August 2012, Howard has completed the NH 48k footers, the New England 67 4k footers, 80 of the NE 100 highest peaks, and “redlined” over 50% of all the trails in the 29th edition of the AMC White Mountain Guide. Howard also has done over 100 winter hikes, climbing 33 of the NH 48 in Winter. He also has completed the Belknap Range Peaks, solo hiked in all 4 seasons, learned navigation skills, bushwhacked, and has become very proficient when it comes to talking about what to wear on your body, and feet. Howard is a bit of a clothing, footwear, and gear “nut.” Howard is also a member of the Androscoggin Valley Search and Rescue, Three-Season Team, and a Trailhead and Backcountry Steward Volunteer in the White Mountains for the US Forest Service. Certifications: Howard is working on obtaining relevant certifications over time while enjoying his time building hands-on experience assisting. A: What’s in my heart when I am in the White Mountains, is gratitude and peace of mind, body, and soul. A: I feel that hiking and being active outdoors, helps stimulate your mind and body in ways a gym can’t. I know this, because I have spent year after year, before I started hiking in 2012, in the gym, an average of 340 days a year. It also allows me to get away, and not dwell on everyday life issues. A: To have fun, and stay in the moment! A: The White Mountains have some of the toughest trails to hike in the world….therefore do your homework/research before you hike, come prepared, and always carry the 13 Hiking Essentials.